As Hurricane Michael was barreling through the Panhandle region, wasp populations were at their highest of the year. 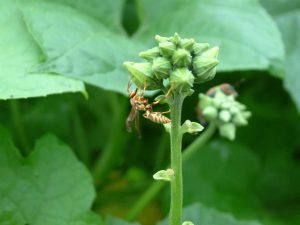 Winds and flooding destroyed many of the nests of paper wasps, hornets, and yellow jackets and now wasps may be aggressive as they defend themselves or remnants of their nests. All are capable of multiple stings that are very painful. It is very likely that you will encounter stinging wasps as they scavenge for food and water, as well as seek shelter among debris and exposed trash. Many people are stung by paper wasps after storms. They are not attracted to traps. Here are a few pointers to help deal with stinging wasps. Try not to swat at wasps flying around or landing on you. You may be less likely to receive a sting if you can flick them off. Some wasps are attracted to the sap from broken or recently cut trees. Look before you reach. Wear gloves and other protective clothing when moving debris in case you disturb foraging or nesting activities. Wasps are also attracted to sugars and water. Try your best to keep food and drink cans covered. Completely close garbage containers or bags that contain food debris. Repellents are not effective against wasps. There are pesticides labeled to spray on smaller paper wasp nests if you find one in a spot close to people’s activity. These are usually aerosol pyrethroids or pyrethrins. Make sure you read the label carefully and use the product as directed. Do not use non labeled products like gasoline to manage wasps. This is not only illegal but can be dangerous to yourself and the environment. 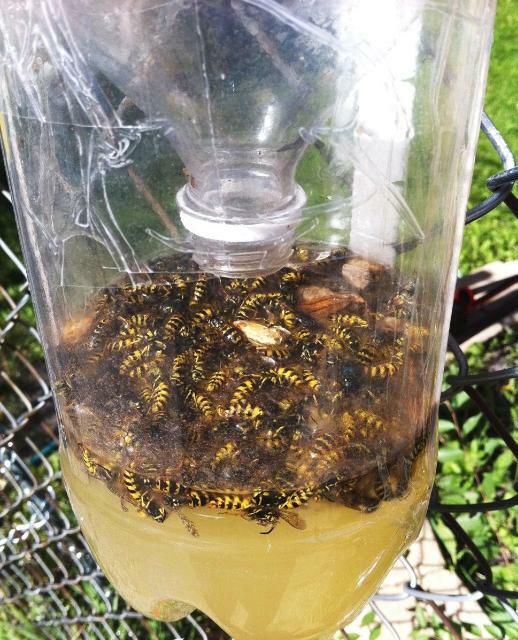 There are traps for yellowjackets that you may purchase or make. These only manage those wasps flying around, not any remaining in a ground nest. Here is a Do It Yourself Yellowjacket trap from UF IFAS Extension. Cut the top 1/3 off your 2 liter bottle so that you have 2 pieces. Add a bait (fermenting fruit or beer) to the bottom of the plastic bottle. Invert the top portion of the bottle into the base, forming a funnel. Hang or place traps so they are about 4 to 5 feet above the ground. For safety, place them away from people.